ClassiX by Xstamper metal/plastic desk and pocket embossers have been engineered to produce higher pressure with minimal effort. Metal Desk Embosser: Our desk embossers have been specifically engineered to produce higher pressure with minimal effort. The extremely stable design sits firmly on your desk making it perfect for repetitive and high volume use. 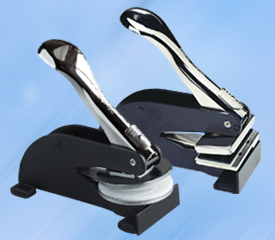 Metal Pocket Embosser: Our pocket embossers are convenient because of their compact size and high leverage that creates clean and crisp impressions. The small and portable design make them perfect for carrying in your purse or briefcase. Plastic Desk Embosser: This award-winning stylish desk embosser creates clean impressions with minimal effort. Your impression is engraved on a brass plate embedded into the handle for easy identification. Seal Highlighter: A pre-inked stamp with a flat impression area sized to match the size of our round seal embossers. When pressed lightly over an embossed impression, it darkens the raised areas for readability. Recommended Use: To Highlight your Embossed Image. Recommended Uses: Notary, Engineering or Government Emboss Sealing. Recommended Uses: Notary, Engineering or Government Sealing. Recommended Uses: Notary, Engineering and Government Sealing.